Shimmer and Shine are back to grant Leah’s every wish. Nickelodeon has renewed the Shimmer and Shine TV show for a third season. 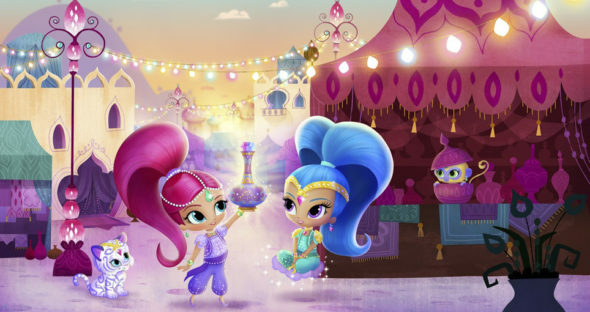 Season three will have 20 episodes full of magical, musical adventures, featuring twin genies-in-training, Shimmer and Shine. The series is created by Farnaz Esnaashari-Charmatz and produced at Nickelodeon Animation Studios in Burbank, California. The Shimmer and Shine TV series voice cast includes Alina Foley, Isabella Crovetti-Cramp, Eva Bella, and Blake Bertrand. Season three of Shimmer and Shine (20 episodes) will follow twin genies-in-training, Shimmer and Shine, as they travel beyond the Rainbow Waterfalls in Zahramay Falls, where new worlds and fantastical experiences await. Journeying aboard their magical boat, Shimmer, Shine and their best friend Leah will explore wondrous locales, meet adorable critters and learn new forms of genie magic. Shimmer and Shine features a social-emotional curriculum highlighting the importance of teamwork, resilience and overcoming obstacles. What do you think? Do you like the Shimmer and Shine TV series? Will you watch the third season? Tell us. More about: Nickelodeon TV shows: canceled or renewed, Shimmer and Shine, Shimmer and Shine: canceled or renewed? They should make Shimmer & Shine Seasons 4,5,6,7, & 8. My daughter loves Shimmer and Shine and I am very happy that they are here for a 3rd season and I am hoping for a 4th. If season 3 makes it I will block Nick Jr in my house! I’ll be happy to see The Renewal of Shimmer and Shine (Season Three). I’ll be happy to see that show. Shimmer and Shine is a good show,which is quite the motivational tool for children to learn about resilience!